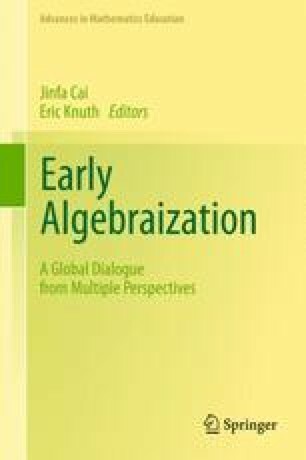 This chapter reviews some key empirical results and theoretical perspectives found in the past three decades of research on students’ capacities to reason with algebraic and graphical representations of functions. It then discusses two recent advances in our understanding of students’ developing capacities to use inscriptions for representing situations and solving problems. The first advance is the insight that students have criteria that they use for evaluating external representations commonly found in algebra, such as algebraic and graphical representations. Such criteria are important because they play a central role in learning. The second advance has to do with recognizing the importance of adaptive interpretation, which refers to ways in which students must coordinate shifts in their perspective on external representations with corresponding shifts in their perspective on problem situations. The term adaptive highlights the context sensitive ways in which students must learn to interpret external representations. The chapter concludes with implications of these two advances for future research and algebra instruction. The research reported in this chapter was supported by a Spencer Foundation Dissertation Fellowship and by the National Science Foundation under Grant No. 9554564 and Grant No. REC 0231879. The opinions expressed in this chapter are those of the author and do not necessarily reflect the views of the Spencer Foundation or the National Science Foundation. This chapter is a revised version of an article published in ZDM—International Reviews on Mathematical Education, 37(1), 60–67. DOI 10.1007/BF2655898.